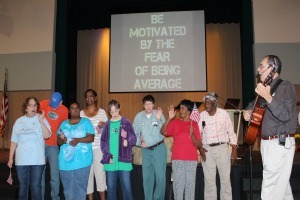 The Arc North Florida, Inc. is a membership organization providing advocacy, employment training and living services for people with disabilities in Suwannee, Hamilton, Lafayette, Columbia and Baker counties. As a community based and qualified 501(C)(3) charity, The Arc provides services to all adults with a variety of intellectual and developmental disabilities including down syndrome, cerebral palsy, spina bifida and autism. In addition many of our clients have visual, hearing, physical and emotional disabilities. Founded in 1981, The Arc provides training and services to approximately 60 people in a five county North Florida area. A volunteer board of directors, elected by the membership, governs the agency. The Arc North Florida has been recognized by the United Way of Suwannee Valley as an approved provider agency since 2005. At The Arc, individuals in our Adult Day Training program receive the necessary training to function as independently as possible and each client is provided opportunities to participate fully in the community. Program participants who have a stated goal of employment receive job skills training to enable them to make a successful transition to work. Our Support Services program allows our clients access to individual recreational, leisure, educational and social opportunities in the community where they work and live. At The Arc, we believe that each person has the right to live where they want and we offer a variety of Residential Services for them to choose from. Individuals who need assistance in living independently in their own home or apartment can receive support from our qualified staff. In addition, we offer our clients the opportunity to live in one of two owned and operated residential homes where they receive training in the daily living and self-care skills necessary to become as independent as possible. The Arc North Florida also offers Personal Care Assistance for our program participants with more severe disabilities allowing them to live independently in their own homes. Our staff can also provide Respite services that will allow families and participants a break from the normal stress created by constant family care.